Clay chimeneas are fun and easy to use. No need for roaring fires, the clay soaks up the heat and radiates it out into the surrounding atmosphere. It is important you observe the instructions and maintenance recommendations. Not all fuels and lighting fuels can be used in clay chimeneas and they will need protection from rain and frost. You will need to put sand or lava stones in the base of the chimenea and fire it up slowly. Several small fires are recommended before a larger fire is attempted. The clay is fire-resistant, but can crack if over-fired. Small cracks can be filled in with fire cement or chim-filler and then the chimenea can continue to be used. Large structural cracks are dangerous and if your chimenea develops one you should stop using it. 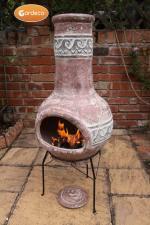 Clay chimeneas are hand-made and hand-painted, so shapes and colours may vary slightly. The paint finish will alter over time. The fire may cause soot deposits and the paint will burn off. The larger the fire the quicker the paint will change. Even if not used and left outside, the clay being porous, it will attract moss and plant matter and change colour too. 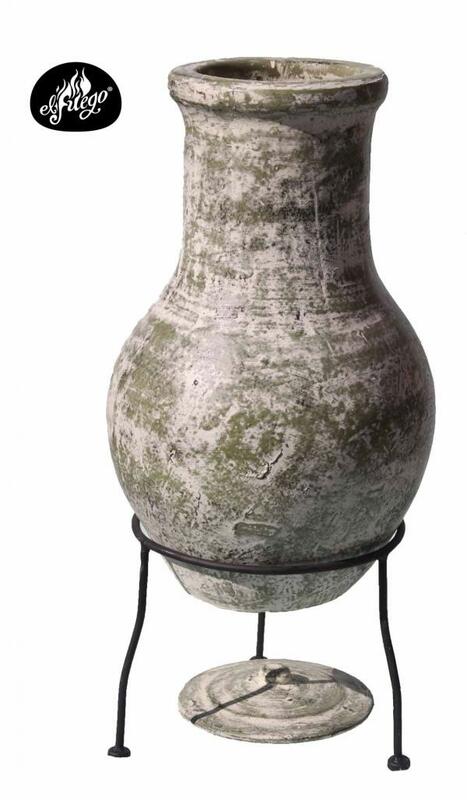 Clay chimeneas are easy to re-paint with any water-based paint after rubbing down with sand paper. Packing Size: 37cm length. 37cm width. 62cm height. USER INSTRUCTIONS OUTDOORS Please read the following instructions and recommendations and use CAUTION at all times for the safe enjoyment of a real patio fire. Please keep these instructions in a safe place so you can read them again from time to time. Â· PLACE your real patio fire on a FLAT surface; you should NOT place on a sloping surface where the fire might tip over. Â· This should be a NON-FLAMMABLE surface such as stone, gravel or bricks. Do not place on grass which may turn brown. Do not place on wood which may turn brown or catch fire. DO NOT PLACE ON DECKING which may turn brown or catch fire. Protect wooden decking with a Gardeco FLOOR PROTECTION or use bricks or concrete slabs. Â· DO NOT place your fire near bushes or plants or under trees; the heat will damage the leaves and is a fire risk. Â· DO NOT place your real fire under an awning; it will burn or melt. Â· DO NOT place your real fire near garden furniture, especially made of fabric or woven plastic, which may melt or catch fire. We recommend at least one metre distance. Â· DO NOT make a real fire inside a conservatory or summer house or shed; real fires are designed to be outside, and fumes emanating from the fire made with wood, coal or charcoal are toxic and dangerous to health. 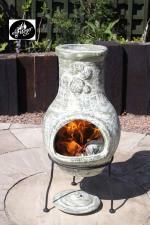 You can use your patio fire indoors ONLY WHEN USING WITH THE CHIM BURNER AND BIO-ETHANOL FUEL. Â· DO NOT touch the real fire when burning; the surface is hot and you will burn your fingers; protect your hands with a Gardeco FIRE GLOVE. We recommend that gloves are used at all times. Â· DO NOT allow children to play or run around the fire. It is not a game. Use a Gardeco CHIMENEA GUARD to prevent small children coming close to the fire. Â· DO NOT PANIC if fuel falls out of the fire or for any reason flames spread out from the patio fire, simply extinguish spreading flames with earth or sand or with water immediately. DO NOT throw water on a real fire other than in an emergency. Â· NEVER LEAVE A BURNING REAL PATIO FIRE UNATTENDED. Failure to do so may result in the fire spreading out of control and result in damage or destruction of property. Please ensure the fire is completely out before leaving the patio fire on its own. Â· We advise against using a real patio fire when it is windy or in the case of droughts. Strong wind may tip the chimenea over which is a fire risk. Wind may also disperse burning material, which is a fire risk, particularly if the environment is dry as in the case of a drought. Â· Please be a good neighbour and be reasonable in the use of your patio fire, keep smoke and noise to a minimum. Â· NE PAS placer votre feu dÂ’exterieur sous un auvent ou store ; il senflammera ou fondra. Â· NE PAS placer votre feu dÂ’extÃ©rieur prÃ¨s de votre mobilier de jardin surtout sÂ’il contient des matiÃ¨res plastiques qui pourraient fondre ou sÂ’enflammer. Nous vous recommandons de maintenir votre cheminÃ©e Ã une distance de 1 mÃ¨tre minimum. Â· NE laissez PAS les enfants,surtout les plus petits dÂ’Ãªtre prÃ¨s du feu. Ne laissez pas vos animaux domestiques prÃ¨s du feu. Â· NE PAS utiliser de pÃ©trole, de paraffine, ou dÂ’allume feu pour allumer votre feu. La meilleure mÃ©thode est dÂ’utiliser du papier journal ou des brindilles sÃ¨ches, tel que les bÃ¢tons OCOTE de Gardeco. Le meilleur combustible est le bois ou charbon. Â· NE JAMAIS LAISSER UN FEU DÂ’EXTERIEUR SANS SURVEILLANCE. Tout manquement Ã cette rÃ¨gle pourrait provoquer une propagation du feu tel que vous ne pourriez pas le contrÃ´ler, et entrainerait des dommages matÃ©riels et corporels. Assurez vous svp que le feu soit complÃ¨tement Ã©teint avant de laisser votre brasÃ©ro Ã lui-mÃªme. Â· SOYEZ un bon voisin en faisant un feu dÂ’extÃ©rieur de faÃ§on raisonnable et veillez Ã maintenir la fumÃ©e et le bruit du feu Ã un niveau acceptable par votre voisinage. 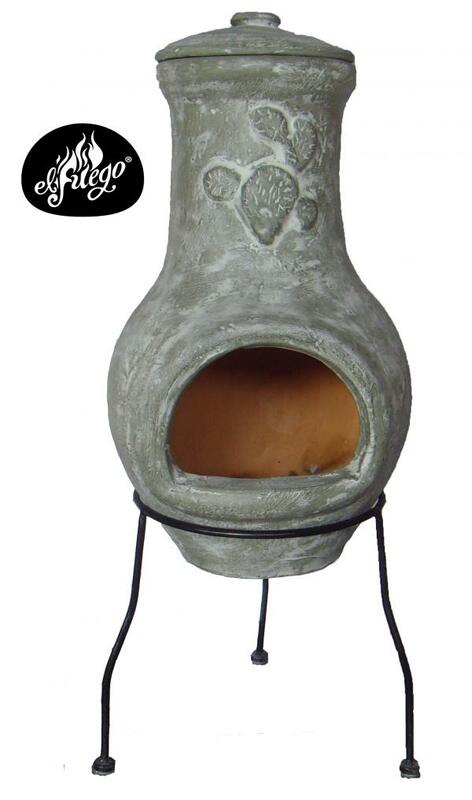 Â· This is a clay chimenea or firepit of handmade by craftsmen. Use your clay chimenea or firepit for warmth and outdoor cooking. It is beautiful to look at and can be used as a garden decoration. Â· Before lighting, put 50mm (2 inches) of Gardeco Lava Stones or sand or gravel in the bottom to protect the base from direct heat. Failure to do this may crack your clay chimenea or firepit. 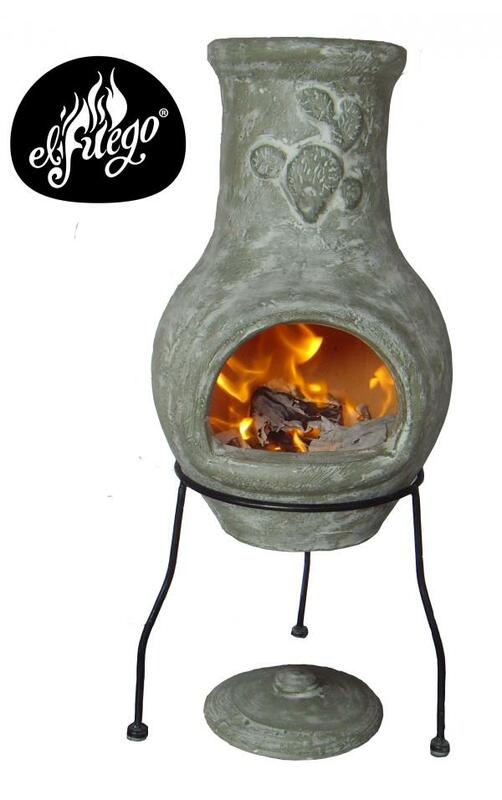 Â· Start the fire with balled newspaper, dry kindling or Ocote sticks. NEVER use petrol or spirit based lighting fuels. They may crack your chimenea or firepit. Â· You may use dry wood logs or charcoal fuel. Clay chimenea or firepits and other patio fires can be used to burn garden refuse such as leaves or branches. DO NOT throw fuel into a clay chimenea or firepit. Wet logs will create a lot of smoke. Â· It is essential to allow the clay chimenea or firepit to warm up slowly by keeping the fire small for the first20 minutes. Add more firewood later but do not build a large roaring fire which may crack the chimenea or firepit and is dangerous. Â· The environmental friendly fuel is wood or charcoal which is carbon neutral. Â· When cooking use locally made charcoal from renewable forests with minimal transport cost. Gardeco Wyre Forest Charcoal is made in the Wyre Forest in the UK West Midlands following to ancient rural methods. Â· Gardeco CHIM LOGS, which are made from environmentally friendly recycled sawdust and burn slowly with little smoke. Â· To start a fire use balled newspaper and kindling. Â· For a fire without firelighters or kindling, use the smokeless Gardeco FIRE LOG, a wax impregnated sawdust briquette, wrapped in a paper. Just light both ends of the paper and the log will burn for about 2Â½ hours. You cannot use Gardeco Fire Logs for cooking. Â· If the fire is slow to start, more air will help, use a Gardeco BELLOWS to blow air into a slow fire. Â· Safety is our main concern, so please use a CHIMENEA GUARD to keep small fingers well away from the fire. Â· Ceci est une cheminÃ©e en argile ou brasÃ©ro fait main par des artisans. Utilisez votre cheminÃ©e ou brasÃ©ro pour vous chauffer ou cuisiner en extÃ©rieur. Ces produits ont un beau design et peuvent Ãªtre utilisÃ©s comme dÃ©coration de jardin. Â· Avant de lÂ’allumer, posez au fond de votre foyer 50 mm (2 pouces) de Lava Stones (Pierre de Lave) de Gardeco pour protÃ©ger la base du foyer du feu. Ne pas respecter cette consigne expose votre foyer dÂ’extÃ©rieur au craquement. Â· Pour dÃ©marrer un feu, utilisez du papier journal, des brindilles sÃ¨ches ou bÃ¢tons dÂ’Ocote de Gardeco. NÂ’UTILISEZ JAMAIS de pÃ©trole ou tout autre combustible Ã base dÂ’alcool. Ils peuvent faire craquer votre cheminÃ©e ou brasÃ©ro. Â· Vous devriez utiliser des bÃ»ches de bois sec ou du charbon de bois. Votre cheminÃ©e ou brasÃ©ro en argile ou tout autre foyer dÂ’extÃ©rieur peut Ãªtre utilisÃ© pour brÃ»ler des dÃ©chets tels que des feuilles ou branches. NE JETEZ PAS vos combustibles dans une cheminÃ©e en argile. Les bÃ»ches humides provoquent beaucoup de fumÃ©e. Â· Il est essentiel de permettre Ã la cheminÃ©e ou au brasÃ©ro de chauffer doucement en gardant un feu doux pendant les 20 premiÃ¨res minutes. Ajoutez du bois aprÃ¨s, mais ne faites pas un trop grand feu, cela pourrait faire craquer votre cheminÃ©e ou brasÃ©ro et cela reprÃ©sente un danger. Â· Pour lÂ’environnement, les combustibles adaptÃ©s sont le bois ou le charbon de bois qui nÂ’Ã©mettent pas de carbone. Â· Gardeco propose une gamme de bois et combustible qui convient Ã lÂ’utilisation des cheminÃ©es et brasÃ©ros, qui proviennent de forÃªts gÃ©rÃ©es durablement. Quand vous cuisinez, utilisez des combustibles tels que le bois ou charbon de bois. NÂ’utilisez pas de combustibles artificiels conÃ§us par lÂ’homme. Â· Pour dÃ©marrer un feu, utilisez du papier journal et des brindilles sÃ¨ches. Â· La meilleure faÃ§on et la plus naturelle de dÃ©marrer un feu est dÂ’utiliser les brindilles Ocote de Gardeco. LÂ’Ocote est une rÃ©sine contenu dans les pins situÃ©s en AmÃ©rique Centrale, un ou deux bÃ¢tons suffisent pour dÃ©marrer un feu. Â· Pour un feu sans allumes feux ou bois sec, utilisez les bÃ»ches sans fumÃ©e FIRELOG de Gardeco, une briquette de cire imprÃ©gnÃ©e de sciure, enveloppÃ©e dans du journal. Allumez simplement les deux extrÃ©mitÃ©s en papier et la bÃ»che brÃ»lera pendant 2H30 environ. NE PAS utiliser les bÃ»ches FIRELOG de Gardeco pour cuisiner. Â· Si le feu est lent Ã dÃ©marrer, un surplus dÂ’air peut aider, utilisez un soufflet BELLOWS de Gardeco pour raviver le feu. Â· La sÃ©curitÃ© est notre principale prÃ©occupation, soyez prudent en permanence. Â· Clay chimenea or firepits are not frost-proof. The chimenea or firepit itself has no drainage, and clay is porous, absorbing moisture. Should your clay chimenea or firepit be left outside, saturated with water when it freezes, it will crack. This is a natural phenomenon which we cannot prevent. To stop this process, keep your clay chimenea or firepit dry. Bring it inside or cover it. Â· With use, the paint finish on your chimenea or firepit will change and discolour, and there will be blackeningAround the rim. The bigger the fires, the faster the paint finish will change. Â· A clay chimenea or firepit can be re-painted with ordinary household emulsion paint after rubbing down to remove any loose paint. Â· The stand is made of steel and will rust. Â· Rust runs may mark flooring, slabs, and patios, so if you are worried abut marking, protect your flooring. Â· To reduce the likelihood of rusting bring inside or protect with a weatherproof cover. Ideally, bring inside for the winter. Â· Cracks in the clay may be repaired with car body filler or fire cement and continue to be used. Â· If a large structural crack appears, stop using the chimenea or firepit and dispose of it. 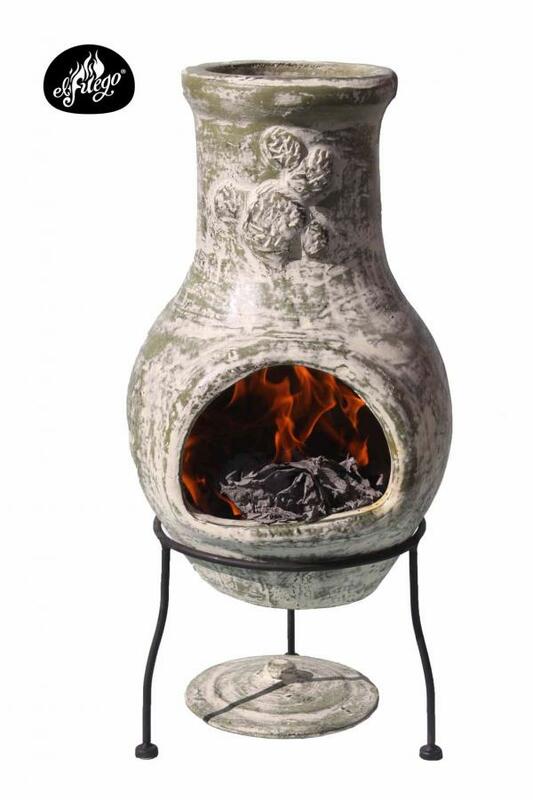 Â· All clay chimenea or firepits crack eventually. INSTRUCTIONS DE MAINTENANCE POUR VOTRE CHEMINEE OU BRASERO EN ARGILE Â·Les cheminÃ©es ou brasÃ©ros ne sont pas rÃ©sistants au gel. Ils nÂ’ont pas de drainage, et lÂ’argile est poreuse, absorbant la moisissure. Si votre cheminÃ©e ou brasÃ©ro devait rester dehors, et saturÃ© dÂ’eau quand il gel, il ou elle craquera. CÂ’est un phÃ©nomÃ¨ne naturel quÂ’on ne peut pas prÃ©venir. Pour stopper ce processus, gardez votre cheminÃ©e ou brasÃ©ro en argile au sec. Rentrez-la Ã lÂ’intÃ©rieur pendant lÂ’hiver ou couvrez-la. Â·A lÂ’utilisation, la finition de votre cheminÃ©e ou brasÃ©ro changera dÂ’apparence et se dÃ©colorera, et elle noircira autour de la bouche ou au bord. Plus les feux sont importants, plus vite lÂ’apparence de la cheminÃ©e changera. Â·Une cheminÃ©e ou brasÃ©ro en argile peut Ãªtre repeint avec une peinture Ã Ã©mulsion domestique aprÃ¨s avoir enlevÃ© le surplus de peinture pour avoir une surface propre. Â·Le support est fabriquÃ© avec de lÂ’acier et rouillera. Â·Une cheminÃ©e ou brasÃ©ro dÃ©colorÃ©e sur un stand rouillÃ© est toujours opÃ©rationnel et vous pourrez continuer Ã lÂ’utiliser. Â·La rouille peut marquer les sols, planchers, pavÃ©s et terrasse, donc si vous Ãªtes inquiets pour les tÃ¢ches, protÃ©gez vos sols Â·Pour rÃ©duire la probabilitÃ© de rouille, mettez votre cheminÃ©e ou brasÃ©ro et support Ã lÂ’intÃ©rieur ou protÃ©gez-la avec une housse de protection impermÃ©able Gardeco. IdÃ©alement, mettez-la Ã lÂ’intÃ©rieur pendant lÂ’hiver. Â·Les craquements de lÂ’argile peuvent Ãªtre rÃ©parÃ©s avec un ciment ignifuge ou body filler et peut Ãªtre utilisÃ©e normalement. Â·Si une grande fissure ou un grand craquement devait apparaÃ®tre, ne continuez pas dÂ’utiliser votre cheminÃ©e pour faire des feux. Utilisez-la autrement, tel un objet dÃ©co. Â·Toutes les cheminÃ©es ou brasÃ©ros peuvent craquer un jour ou lÂ’autre. Special care and attention is necessary when cooking on a chimenea or fire bowl to avoid contamination by smoke or soot. Des prÃ©cautions sont Ã prendre lorsque lÂ’on cuisine dans une cheminÃ©e ou un brasero afin dÂ’Ã©viter toute contamination par la fumÃ©e ou la suie. CLEANLINESS IS ESSENTIAL All cooking accessories MUST BE THOROUGHLY CLEANED BEFORE USE. Â· BBQ grills and other accessories are coated with vegetable cooking oil during manufacture but may have gathered dirt and dust therefore need to be cleaned in hot water and detergent to remove any foreign matter and debris. Â· After cleaning and drying, cooking accessories are best lightly coated with vegetable cooking oil before use. . After use, they need to be cleaned again with hot water and detergent and coated with vegetable cooking oil before storing. NEVER USE MINERAL OIL. Â· After use the surfaces of the cooking accessories in direct contact with the fire will be covered in black carbon soot. Soot can be washed off with hot water and household detergent or washing up liquid. Be careful because black soot residues will mark surfaces, tea towels or washing up cloths. All soot must be removed before oiling and storage. Â· AprÃ¨s utilisation, les surfaces des accessoires de cuisine qui ont Ã©tÃ© en contact direct avec le feu seront recouvertes de suie noire. La suie peut Ãªtre nettoyÃ©e avec de lÂ’eau chaude et un dÃ©tergent ou du liquide vaisselle. Faites attention, la suie laisse des rÃ©sidus qui peuvent marquer vos surfaces et vos torchons. Toute la suie doit Ãªtre retirÃ©e avant de les recouvrir dÂ’huile et de les ranger. FUEL Do not cook on flames, if you do this there will be a soot residue on the food, which is unhealthy. Be aware wood is often treated with preservatives which are toxic and can contaminate the food. Â· When cooking use dry wood or charcoal, and allow the wood gas to burn off as flames to leave hot glowing embers, cook on the embers. Â· If meat releases fat onto the hot embers which makes a flame, move the meat away from the flame. Â· Assurez-vous que votre viande est bien cuite Â· Lorsque les accessoires de cuisine sont retirÃ©s du feu, ils sont chaud et doivent Ãªtre placÃ©s sur une surface non inflammable afin de retirer les aliments. Â· NE PAS placer les accessoires de cuisine sur le brasÃ©ro ou la cheminÃ©e, lÂ’herbe, la terre ou Ã mÃªme le sol. Utilisez de prÃ©fÃ©rence une table ou socle pour cheminÃ©e Gardeco. Â· Les parties des accessoires de cuisson qui sont en contact direct avec le feu peuvent Ãªtre recouverts de suie. Assurez-vous de ne pas mettre de la suie sur les aliments. Â· ATTENTION CÂ’EST CHAUD ! NE PAS TOUCHER, les accessoires de cuisine en acier et en fonte sont trÃ¨s chauds lorsquÂ’ils quÂ’ils sortent du feu, ne pas les touchez avec vos doigts et protÃ©gez vos mains avec les GANTS spÃ©cial feu de GARDECO. Â· A flat spatula is useful to release foods from the accessory. Â· Your cast iron or steel chimenea may already be equipped with a SWIVELLING BBQ GRILL, made of either chromed steel or cast iron for barbecuing on your chimenea. These can also now be purchased separately from the chimenea itself. Les accessoires de cuisson GARDECO sont spÃ©cialement conÃ§us pour Ãªtre utilisÃ©s a lÂ’exterieur, dans les cheminÃ©es, braseros, BBQ ou feu dÂ’extÃ©rieur. Les matÃ©riaux utilisÃ©s conviennent Ã des feux dÂ’extÃ©rieur intense, et sont Ã©quipÃ©s de longues poignÃ©es pour garantir une certaine aisance sans vous brÃ»ler les mains. IL NÂ’EST PAS RECOMMANDE DÂ’UTILISER DES POELES OU MARMITTES DE CUISINE pour cuisiner sur des feux dÂ’extÃ©rieurs. Les poÃªles de cuisine peuvent Ãªtre conÃ§us pour des feux de moindre intensitÃ© et recouverts de matiÃ¨re plastique anti-adhÃ©rente qui pourrait fondre au contact du feu dans une cheminÃ©e ou un foyer ouvert. Les accessoires de cuisine GARDECO sont conÃ§us pour la cuisson des aliments dans un feu Ã foyer ouvert. Â· Le SMOKER PAN est idÃ©al pour une cuisson lente et savoureuse des aliments pour BBQ. Â· LÂ’arbre Ã MARSHMALLOW pour griller 5 chamallows Ã la fois. Â· Le WAFFLE IRON de Gardeco pour faire des gaufres. Â· Le CHESNUT PAN de Gardeco est idÃ©al pour griller des chÃ¢taignes grillÃ©es. Â· Utilisez la CHIM BBQ GRILL de Gardeco amovible pour les cheminÃ©es en argile, pour rÃ©aliser une cuisson de barbecue sur grille. Â· Votre cheminÃ©e en fonte ou en acier peut Ãªtre Ã©quipÃ©e du SWIVELLING BBQ GRILL, qui est fait soit dÂ’acier chromÃ© ou de fonte pour transformer votre cheminÃ©e en BBQ. Ils peuvent aussi Ãªtre achetÃ©s sÃ©parÃ©ment de la cheminÃ©e. Tous les accessoires de cuisson, si fournis avec le produit ou sÃ©parÃ©ment, doivent Ãªtre nettoyÃ©s avant la premiÃ¨re utilisation pour enlever les saletÃ©s liÃ©s Ã la fabrication ou aux opÃ©rations dÂ’emballage. Nous vous recommandons de les laver avant chaque utilisation par la suite, mÃªme sÂ’ils Ã©taient rangÃ©s propres. Tous les accessoires de cuisine Gardeco en fonte, les grilles barbecue incluses sont recouverts dÂ’une pellicule dÂ’huile vÃ©gÃ©tale de sorte Ã stopper la formation de rouille lorsque vous les acheter. AprÃ¨s utilisation, tous les accessoires de cuisine doivent Ãªtre nettoyÃ©s Ã lÂ’eau savonneuse pour enlever les rÃ©sidus dÂ’aliment et de suie. SÃ©chez-les soigneusement et recouvrez-les dÂ’une pellicule dÂ’huile vÃ©gÃ©tale avant de les ranger. Si vous ne le faite pas, lÂ’accessoire commencera Ã rouiller. NE JAMAIS utiliser de lÂ’huile minÃ©rale qui est nocive pour la santÃ©. Pour les accessoires de cuisine achetÃ©s sÃ©parÃ©ment, suivez les instructions fournis dans lÂ’emballage. Si votre cheminÃ©e est Ã©quipÃ©e dÂ’une grille BBQ en fonte pivotante, pensez Ã la retirer et Ã la nettoyer avec soin, puis recouvrez-la dÂ’huile vÃ©gÃ©tale avant et aprÃ¨s usage. Mettez la nourriture directement sur la grille du BBQ, quÂ’elle ait Ã©tÃ© prÃ©chauffÃ©e ou pas. Pour les pizzas, utilisez la pierre Ã pizza. Utilisez lÂ’ustensile multi usage qui est fourni afin de faire pivoter la grille BBQ pour lÂ’enlever ou la remettre. Ne jamais toucher la grille BBQ chaude directement avec vos mains. Une grille BBQ en fonte reste chaude longtemps aprÃ¨s usage mÃªme sÂ’il elle a Ã©tÃ© enlevÃ©e de la cheminÃ©e.